Elections have consequences, and this week we saw the outcome of the last several election cycles bear fruit. The 2014 election handed a Senate majority to the Republican party, and the 2016 election produced a Republican President. As a result, the US Supreme Court welcomed Justice Kavanaugh to the bench this weekend. In 2012 Texas voters sent Ted Cruz to the US Senate. He has consistently stood in defense of our founding principles, and as a representative of Texas values, for nearly six years as our Senator. This week, we saw his determination to do what’s right in the face of intense opposition from the left. None of us knows what challenges might be ahead for our state and nation, but what we can know for certain is that we have a champion for liberty who understands the difference between a representative republic and mob rule. Your vote for Ted in 2012 made all the difference this week, and your work now to re-elect him to a second term will ensure we have an advocate in the Senate for another six years. With just 30 days remaining in the 2018 race, now is not the time to sit back and celebrate the past. Instead, we should see recent events as a reminder that we have to finish what we started. 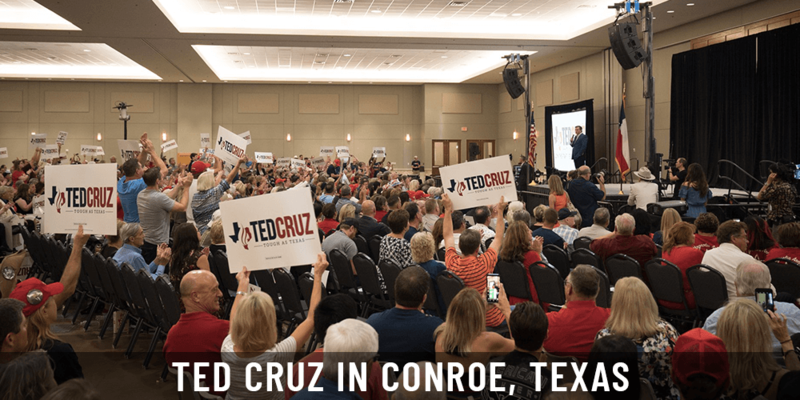 As a reminder, it’s not too late to use the #CruzCrew mobile app on your phone to contact voters in Texas and ask them to support Ted Cruz. Also, if you are able to join us in the Houston office to make calls, or if you are willing to block walk in your part of the state, please sign up to volunteer on-line.